Jewett, a Plymouth singer-songwriter, decided to coordinate “Songwriters Round” shows after releasing his 2016 full-length genre-defying album, “Tending the Fire,” and forming a series of friendships with Petty, Capps, Corbin and Clark. Last year’s opening of 20 Front Street also sparked Jewett’s interest in bringing his singer-songwriter friends together for an in-the-round performance. “Immediately after that first show, we agreed we had so much fun that we would like to do it again, so I started shopping around for places where we could book it,” Jewett said. 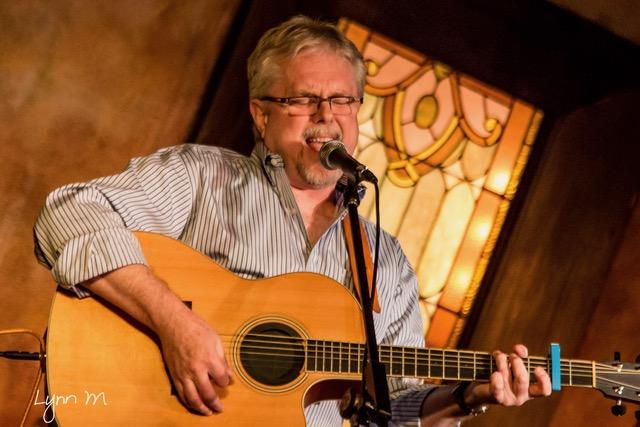 Jewett started developing local singer-songwriter partnerships after reentering the Michigan music scene 10 years ago and attending Above the Bridge Songwriter’s Weekend retreats in Curtis. Over the next five years, Jewett honed his singing and songwriting skills to craft 11 memorable tracks for 2016’s follow-up, “Tending the Fire,” a mix of folk, rock, pop, country and blues intermingled with stories about cheap mascara, broken coffee mugs, slate-colored skies and life changes. He also sings a catchy “creepicana” murder ballad, “Shovel Full of Justice,” with Clark. With an EP and full-length album under his belt, Jewett is penning songs for his next project, which will include more of an acoustic, stripped-down sound. “I’ll probably try to get some singles recorded, but I don’t know if it will happen before the end of the year, certainly by the end of January,” he said. These two sonic canvases showcase the heartfelt emotion behind Petty’s lyrics and provide a foundation for her classically-trained voice and harmonies to soar in the pop-rock world. Petty achieved her first commercial breakthrough with Red Pill Entertainment after sharing initial demos for “Mystery Keeps You” on MySpace in 2006. That grander scale led to Petty performing at prestigious venues, including Carnegie Hall, The Kennedy Center, Club Passim and Tupelo Music Hall and sharing the stage with her music hero, Sarah McLachlan, as well as Andrea Corr and Loreena McKennitt. Petty’s also working on her follow-up album to “House of Doors” and recording new material with Andy Reed at Reed Recording Company in Bay City. [/caption]At age 16, Corbin developed an affinity for playing the guitar with friends and became hooked on the MTV Unplugged acoustic sound of Nirvana and Alice in Chains during the ‘90s grunge era. He later discovered the iconic folk of Bob Dylan, the legendary blues of Muddy Waters, Howlin’ Wolf and Stevie Ray Vaughan and the guitar virtuosity of Jimi Hendrix. His love of well-known national acts eventually transpired into a deep appreciation and respect for the Michigan music scene. 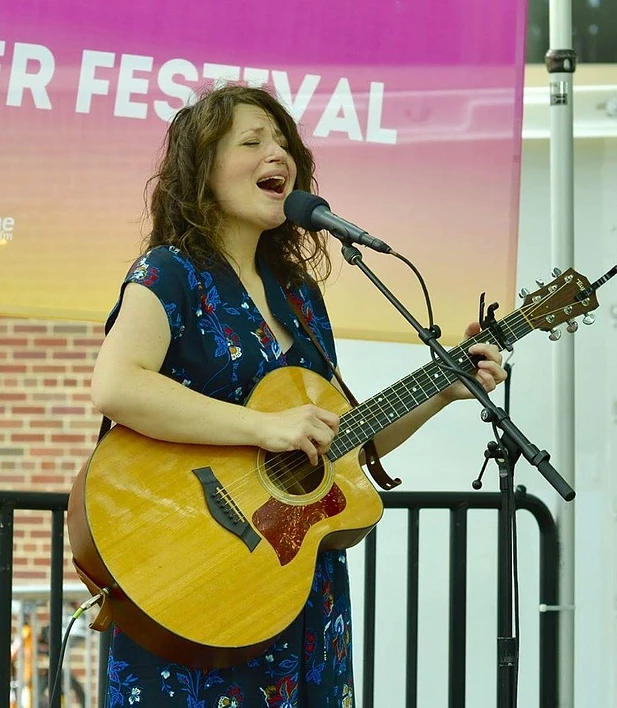 Corbin met several local musicians, including Lansing Americana folk roots singer-songwriter Jen Sygit, after performing at coffee shops, small bars and open mic nights. In 2010, Corbin teamed up with Earthwork Music, a collective of independent Michigan-based musicians who focus their efforts on environmental advocacy, social justice, creative empowerment and community building. Through the collective, he performs with local musicians and supports the annual Earthwork Harvest Gathering festival near Lake City. Two years ago, Corbin released his third and most recent album, “Let the Fire Burn Strong,” a beloved nine-track collection of Americana, folk and roots-inspired tunes. The album holds a special place in Corbin’s heart since he and his wife were expecting their daughter, Emaline, at that time. 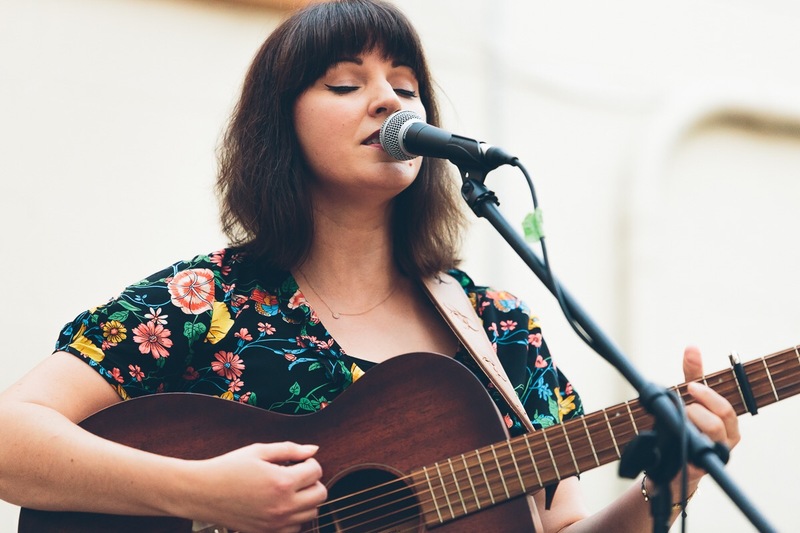 Originally from Livonia, Clark didn’t enter the Michigan singer-songwriter scene until 2011. The former theater stage manager made the transition to music after yearning for another creative outlet. Clark returned to playing the guitar after a seven-year hiatus and met John Natiw, her partner in the Americana folk roots duo The Potter’s Field, at a random open mic night after bonding over John Prine’s 1971 fan favorite “Angel from Montgomery.” That chance meeting led to the pair releasing their debut album, “Pleasureville,” in 2011. Locally, Clark’s creative journey has led to additional collaborations with Natiw, Jewett and Jason Dennie. She hopes to write and record another album with Natiw under The Potter’s Field moniker soon and release her own material. 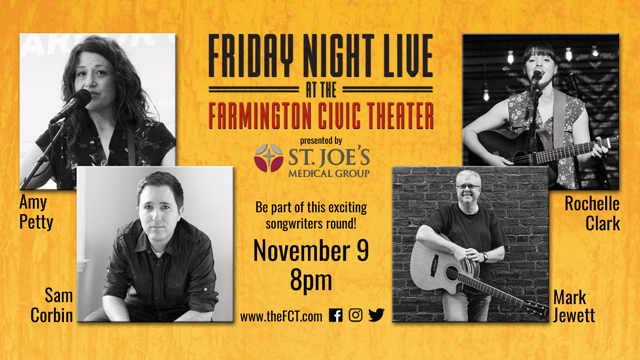 We are very excited to have Mark, Amy, Sam and Rochelle on stage” Friday Night Live” at The Farmington Civic Theater. The combination of these artists , this venue and the audience will make for a magical night of Real Music by Real Musicians in Real time. I’m looking forward to coming to the theater for the first time on Friday and seeing everyone perform. Should be magical night filled with great music and stories!